Aliases: Instructor Flik, Teacher, Miss. B (To humans). Fur: Silver to almost snow white with a bit of leopard spots around the neck and face. Appearance details: The albino, small-horned, mane-less female Charr stood at a height even shorter than Dinky. She wore an icy blue linen robe with pants and common sandals to cover up her footpads. Very basic wear for an Elementalist. What makes her stand out is her fiery red eyes that contrast her snow white fur. Personality: What Flik lacks in size, she makes up in personality. Flik is fiercely loyal to those whom have proven to be her friends, however she goes off like a mortar whenever anyone makes fun of her size. She uses her age and experience as well as a bit of ferocity in her conversations. She is also a teacher, a caretaker, and above all else, a soldier for the Charr. Religious beliefs/philosophy: Religion does not play a part in her life whatsoever and actively despises it. "The largest starter of war is religion," she would say. Even with that, she believes that the 5 races of Tyria need to stop fighting and find a way to coexist. Childhood: As a child, Flik was bullied to an extreme for her albino looks, lack of horns, affinity for magic, and relatively short stature. She didn't take very well to this and trained to the point of snapped bones, ripped muscles, and total mental exhaustion in the art of both magic and wood (wooden swords). After a few years, she proved herself to be a very, very powerful force to be reckoned with among the cubs. Almost everyone in her generation can't remember her without remembering a broken nose, seared flesh, or a snapped tail. History: Out of the Fahrar, Flik was part of the Blaze Warband which didn't get as much attention. Their notable accomplishments were sabotaging the Flame Legion by messing with their spellbooks, causing their rituals to backfire, rigging machinery to explode, poisoning their food supply, and ambushing them during their meetings. Now most of the Blaze Warband is either dead, disabled, or inactive in the field. Flik was inactive as well and was set to raise the cubs in the Ash Legion Fahrar. This lasted a good 20 years. She would teach, train, and care for the cubs. She has seen many a warband's being formed and sent out to either succeed or die in the field. For so long, Flik has felt the itch to set out once more against the enemies of Ash Legion. It was not before the events leading up to Duke Barradin's Crypt that Flik learned that her legionnaire, Rytag Blazepaw was dying due to old age and simply could not fight anymore. It was then Flik picked up her staff once again to go out in the field and rebuild her Warband, doing what she can to get promoted to Legionnaire. Notable relationships: Nothing notable. She never gave herself any time for any serious relationships. Strengths, talents, and points of pride: Since she trained as hard as she could as a child, her physical and magical abilities were made even more powerful as she grew up, though she always had an affinity for Elemental magic and prides herself on her abilities. She also takes great pride in teaching and her abilities to keep calm and think in dangerous, or even deadly situations. Her age and experience make her a wonderful source of wisdom and a voice of reason. Weaknesses, detriments, and points of improvement: Her age on it's own is both a strength and a weakness. Her physical prowess is not what it used to be, and she still reacts badly when anyone makes ill mention of her stature. Another issue is that, after raising cubs for so long, she calls anyone younger than her a cub, which could lead to pretty heated situations. Fears: Ever since she was a child, Flik has always been afraid of heights. Strange, for a feline. She absolutely hates them and unless she didn't have a choice, she would find a way around. Favored alcoholic beverage: Coffee Liqueur with a bit of cream. Favored food: Lamb and Mutton. Favored weather or season: Winter, for it compliments her fur color. How does your character react when she finds a powerful weapon: Unless it's a staff, she'll most likely give it to someone else in her warband or guild who can use it. She finds a coin purse: Pockets it. Whomever owned it is probably dead anyway. She finds food: Doesn't eat it. Who knows where it's been or who it belongs to? Flik brings her own packaged rations. She finds a trap: Alerts her warband. She finds a corpse: She's seen and made plenty. It isn't going to bother her one bit unless it's someone of importance. She finds a suspicious scroll: She wouldn't open it, and instead take it to an appraiser (or a thief) to get it analyzed in case it's trapped. Any roleplay preferences or limitations for this character: None that the player can think of off the top of his head. RP'd out violence is kind of annoying though. Mane: Dark black and long. His mane covers the entire back side of his neck. Fur: Brick Red coloring. With darker red spots and stripes on his body and face. Viktor was big. Very, very big even for a Charr. His natural fur color is brown, though it changed as his enemies blood spattered and stained it, giving Viktor some of his unique nicknames. His armor is quite the same, as anyone could see that his armor was a dark red with a few patches a brown. No amount of washing could get rid of his stains, so he kept them like a wearable trophy to show off his deeds in the name of the Blood Legion. His horns were larger than life, spiked, and slightly bloodstained as well. Personality: Viktor is a hothead, A large beast with a fiery temper and he knows how to use it which is how he got his many aliases through the years. It would be easier to fell him in combat than it would be to gain his trust. Viktor is a traditional Charr with absolutely no love for the other races, (Though a mutual respect for Norn since Norn and Charr share a lot of the same values). He will always be looking for a reason to gut a human. Viktor is the teachings of the Blood Legion personified. 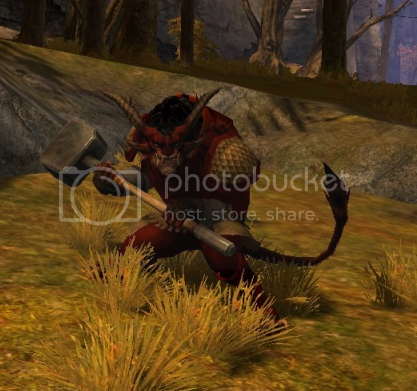 His personality has earned him both fear and respect among his fellow Charr. Hardly anyone wants to even approach Viktor, much less try to cross him. Religious beliefs/philosophy: He believes that the other races are inferior to Charr. The only reason he isn't going around murdering the other four races is because his superiors told him not to. As for religion, he like other Charr actively despise it. Especially the Human's Gods. Childhood: Viktor was a big mean bully as a cub. No one knows why he was. Maybe he has a permanent splinter stuck in his paw, maybe he hit his head as a cub and didn't know many other emotions other than anger, maybe the teachings of the Blood Legion sunk in deeper than the other cubs. Whatever the case may be, throughout his childhood, he was the biggest handful in his generation and made his first kill when he was 4, against another cub in training. The other cubs either hated him, feared him, or respected him. History: Out of the Fahrar, Viktor was a nasty bully who did not listen to authority and was never in control of his unbridled rage. On a mission to attack a minor Flame Legion camp, Viktor decided to charge in without any real reinforcements. The attack was successful, though with a heavy cost. Flik's old Legionnaire, Rytole Ragehammer died for having lost the element of surprise. Viktor was then kicked out of the Warband by his new legionnaire, Vitlov Ragefist. Leaving Viktor a Gladium for 20 years. During his time as a Gladium, Viktor got by becoming a gladiator, even nearly becoming a champion and performing solo missions against Flame Legion. Viktor had his big break last year when he single-handedly up-heaved a large breeding ground of harpies. Viktor killed all of them, and made sure to smash the eggs, dealing a heavy blow to the harpie infestation. It caught the eye of his superiors who commended him for the deed, though he was still an honorless Gladium. Not long after, Viktor heard the news of his old Warband. During an attack, there was only a Sole Survivor of the entire band. Still feeling the sting of disgrace, he set about to make things right. It's been 20 years since he's been kicked out. By that time, Viktor has matured. He now has control of his rage and can actually listen to authority for once. He set about to make sure the last of his Warband wouldn't turn into a Gladium like him. Notable relationships: He will only associate those who have proven themselves to him, regardless of blood relation or guild affiliation. Strengths, talents, and points of pride: Viktor lives up to the aliases given to him in the gladiator arena with other Charr and those of other races who know of him. He is steadfast in Blood Legion's goals, he is merciless, and he is a juggernaught, for lack of a better word. For most people, to fight Viktor is suicide. He uses anger like a weapon itself and unleashes it upon his foes. One good social quality he has is that he's upfront and honest. Weaknesses, detriments, and points of improvement: Viktor is ill-mannered and has a very, very violent temper that has gotten him in trouble with the other charr and even nearly caused a war between Black Citadel and Rata Sum. (That's a story your character's gonna have to ask him about). He fights hard and not smart, he does not take time to analyze situations before striking. He just strikes and uses his battle instincts. He is Blood Legion personified, the good and the bad. Fears: "Fear? What the hell is that? Doesn't sound like food, so I don't give a damn." His only real fear is that he might get killed in his sleep. Which is more than plausible. Favored alcoholic beverage: A fiery and very strong beverage called, "Red Dragon Whiskey" which is said to have a drop of red dragon blood mixed into every barrel. Only those with strong stomachs and a tolerance for heat can withstand this drink without immediately vomiting after the first sip. Favored food: Chile's. All varieties of Chile's. He likes his food to bite back. Favored weather or season: Winter and fall, he likes the cold. Favored color: "Do I really need to answer this?" You find a powerful weapon: If it's more powerful than the one he's carrying, he take it with a happy grunt. If not, then he either sells it, salvages it, or gives it away. You find a coin purse: Pockets it. He doesn't care. It probably dropped off of someone he killed anyway. You find food: He doesn't eat food that he finds unless it's right off the vine. One of Viktor's passion's beyond fighting is cooking. Viktor understands sanitation as should all cooks. You find a trap: "So what? It takes more than that to kill me." You find a corpse: He'll cut it's head off. "Don't want it turning into an undead." You find a suspicious scroll: "It's just paper with words I probably can't even read. I'll just give it to some cloth-wearing weakling. Hope it explodes on them. Very nice I do like the 'finds the corpse' question a good bit.